A “whole” health approach to your pet’s wellness. We believe in using both ancient medicine and modern science for an integrated health care approach. What does integrated medicine mean? Let’s use the example of a dog suffering from arthritis. Traditionally, a pharmaceutical alone would be used to control pain. Your Doctor practicing integrated medicine may offer anti-inflammatory medication in combination with laser therapy and acupuncture for pain control, supplements to protect cartilage and decrease inflammation and water treadmill therapy for strength, mobility and physical fitness. Studies have shown that this approach creates better results for your pets. As you can see this isn’t “alternative therapy” it’s complete therapy! Acupuncture– stimulates nerves that transmit the signal to the brain. The brain then release various chemicals that produce physiological effects to maintain the body’s homeostasis. Laser Therapy– accelerates the body’s natural healing, decreases pain and swelling, stimulated nerve regeneration and promotes tissue repair. 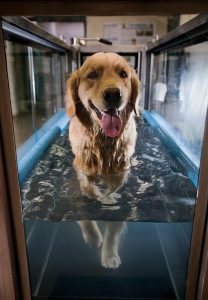 Under water treadmill– low impact exercise increases strength and mobility, promotes weight loss and builds strength. Rehabilitation/Physical Therapy- exercises that work on strength, musculoskeletal and neurological functions. They include range of motion, stretching, massage, cavalettie rails, balance boards, and therapy balls. Treatments can be used to help with many conditions including: arthritis, weight loss, neurologic injury such as disc disease, orthopedic injury such as cruciate tears, muscle injuries, hip and elbow dysplasia, and fracture recovery. Ask your doctor about the plan that’s right for your pet.